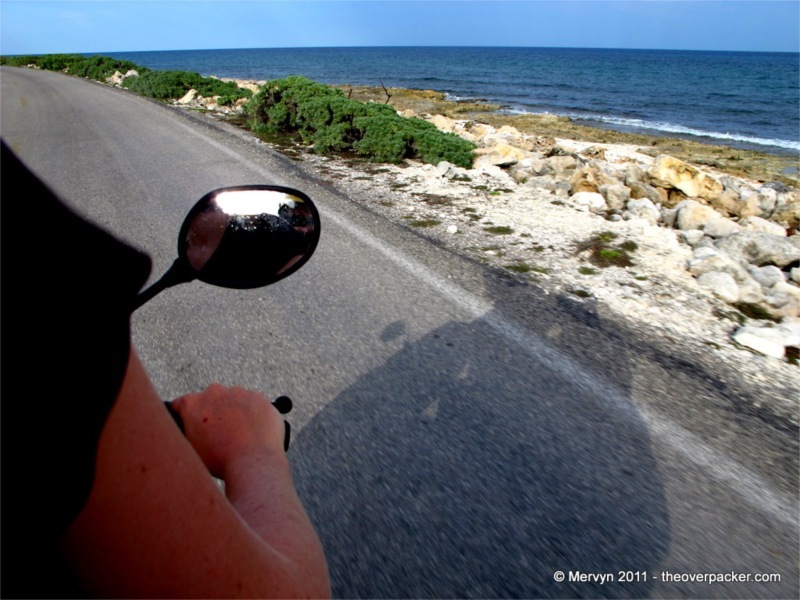 This morning Belinda–my Aussie travel companion–and I rented a motorbike to explore Cozumel. Under ping pong ball shaped helmets we dodged through traffic on our way out of San Pablo wind in our hair and wheels pointed south. My fondness for motorbikes is well-documented. They provide the mobility and in-the-wind openness of bicycles, but without all that pedaling crap. The latter is especially useful when navigating tropical heat. It also doesn’t hurt that motorbikes cost less to rent than cars. What can I say? I’m cheap. A few miles out of town, we stopped at one of the numerous beach clubs that line the western (read: tourist) side of Cozumel. We parked our ride in the crowded parking lot just as a group of college students hopped out of a jeep. They called to each other in the way people do when they’re used to getting what they want. Here, it was pretty clear that what they wanted was a good time. We strolled past the club’s large pools and hot tubs towards the beach. On a stretch of sand packed with plastic lounge chairs the margaritas flowed, jet skis cruised out from shoreline rental shops, and Lady Gaga and Black Eyed Peas blared from the speakers. All the waiters, hostesses, and bartenders were brown, serving a rainbow of foreign clientele, everything from Euros in clenched Speedos, to Floridians with Southern tinged twangs, to scurrying rug rats. The cruise ships were in town and this host of day trippers were having their fill of sun and sand. Most guests wore neon green wrist bands bearing the name of the beach club (signifying paid entrance fees? access to an open bar? a love for the fluorescent 80’s?). 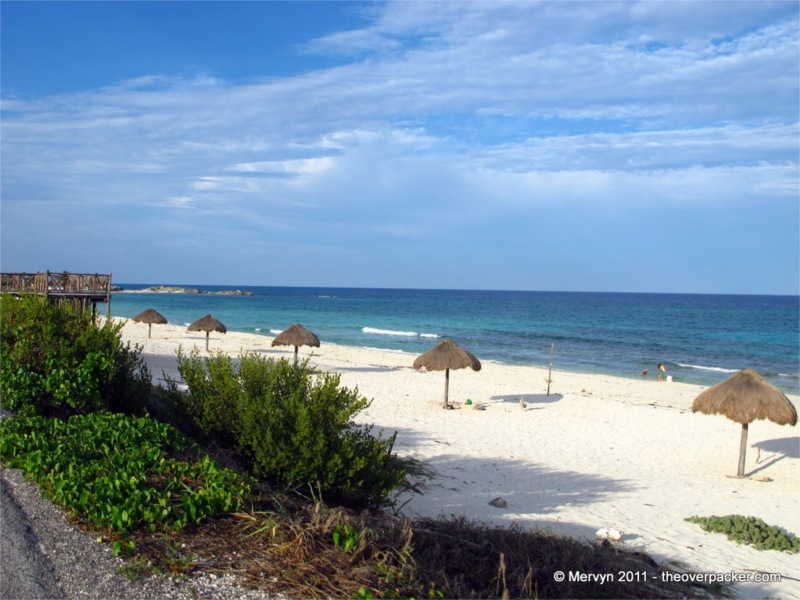 Beaches in Mexico are technically public land and everyone is supposed to be able to visit any beach for free. Beachfront hotels and clubs are obligated to provide a way for the public to cross their land and get to the water. In practice, though, places like this aren’t always welcoming to local Mexicans. The beach club’s buildings, tourist toys, and bars almost run into the water. One can also easily imagine the staff making it uncomfortable for a local family trying to visit this beach for an afternoon picnic. Then there’s the cultural divide—everyone here has the air of a wealthy Westerner on a one week holiday. Money? No object. Seven dollar beer? Put it on my tab and add three Hurricanes and five shots of tequila while you’re at it. In other words, these clubs are as Mexican as Taco Bell. Luckily, Belinda and I are well-versed in Western ways. These were our people. They had our money, our language, and our Western customs. They were us. If we just kept our mouths shut and acted like we were expected to be served, we’d be hassle-free. When we’d had our fill (less than an hour), we rinsed in the club’s showers, and hit the road, choosing to let the wind blow us dry. 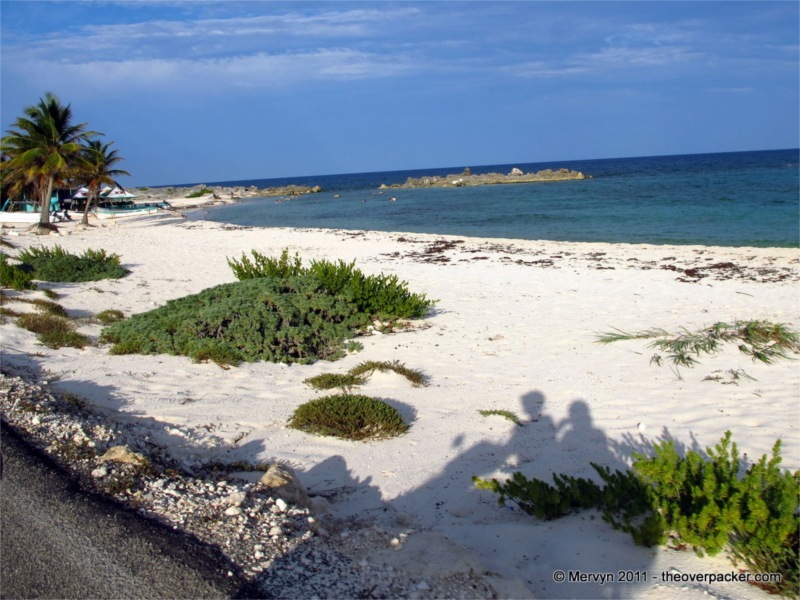 For a while, we continued our counterclockwise loop of Cozumel. On the far side of the island, we stopped for tacos at a seaside rasta restaurant that bore the familiar red, yellow, and green colors of weed and Marley lovers everywhere. There wasn’t another building in sight. A close look at the restaurant revealed the structure a sustained hurricane damage, but it seemed that most of the heavy, scarred wood beams had survived the storms. We ate our meal off a wooden table on the restaurant’s quiet beach. We finished our food and continued on. The further we went the less the island felt like a tourist waypoint and the more it became an actual community. The buildings were sparse. Free of the flesh of thousands of beachgoers, the Caribbean water cleared. 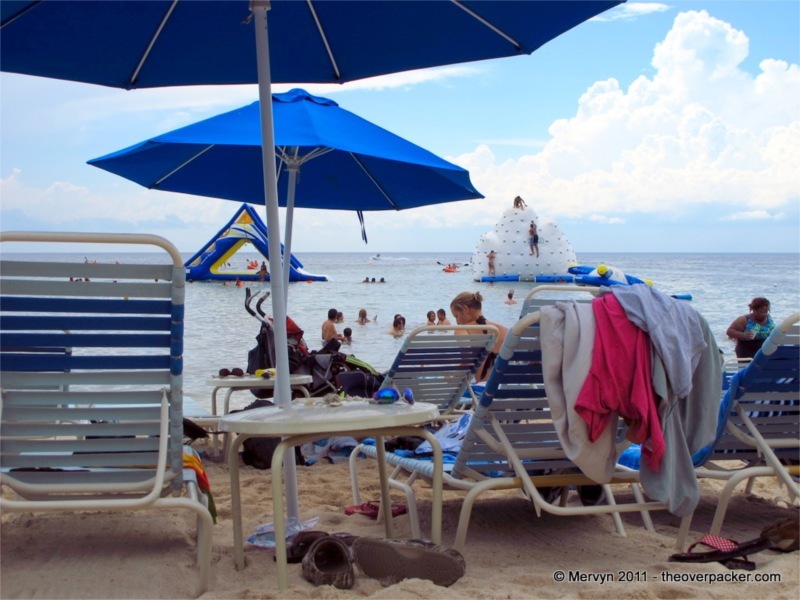 The sands were no longer pocked with plastic chairs. The only sound was that of waves crashing on shore. There were still signs of tourism. A few stands selling souvenirs. Some thatch shade shelters. A couple restaurants that impractically jutted over the water. But, unlike the beach clubs, there was no mistaking this for the deck of a cruise ship. 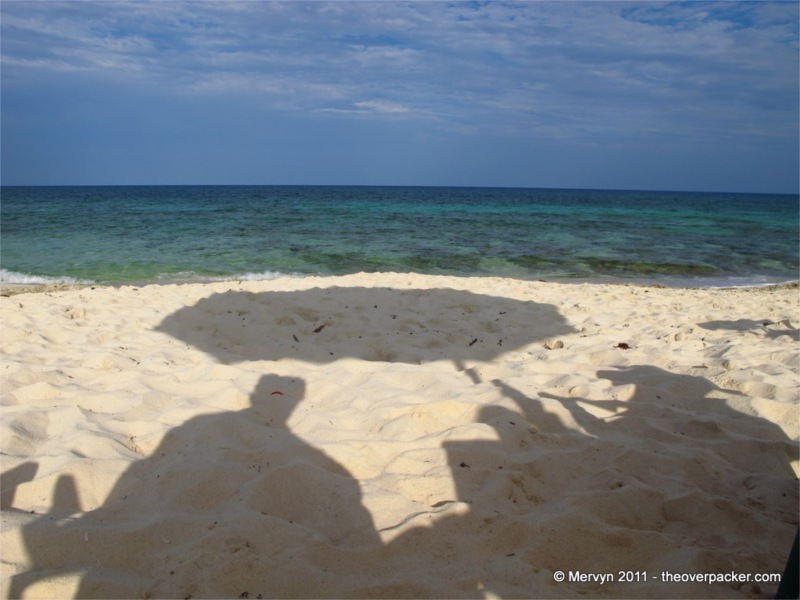 Our shadows danced along the uneven white sand as the motorbike cruised by residents taking advantage of crudely installed volleyball nets and the rock formations that served as natural, beachfront seating. Above the wind, we could make out the laughter of local families enjoying a day on their beach. Here, on this side–on the far side–we were foreigners once again. GALLERY: Click through to see a couple pictures from the night dive Mervyn took later in the evening. 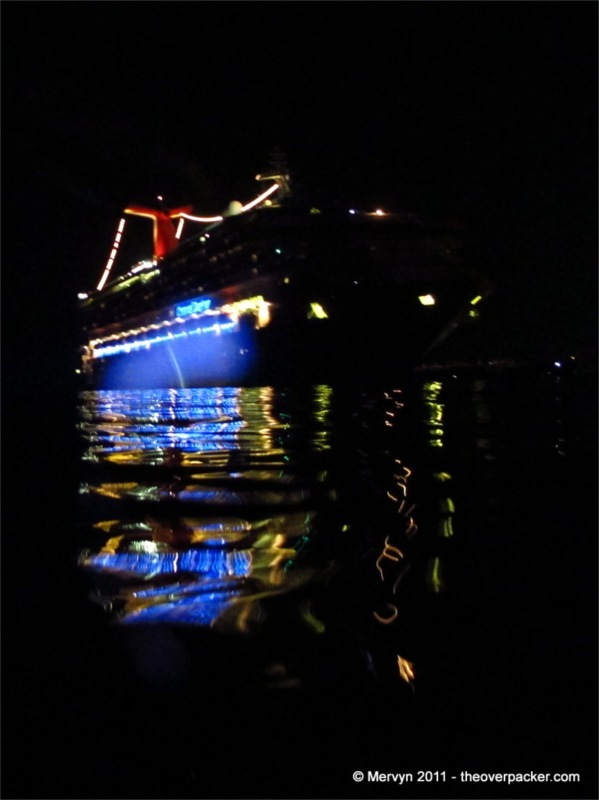 The night dive is also the source of the two cruise ship pictures above. Mervyn is a traveler who brings too much, eats too much, and writes waytoo much. To learn more, read his overwritten FAQ or flip through the archives. If you enjoyed this post, please recommend it using the buttons below and Mervyn’ll be your best friend forever. 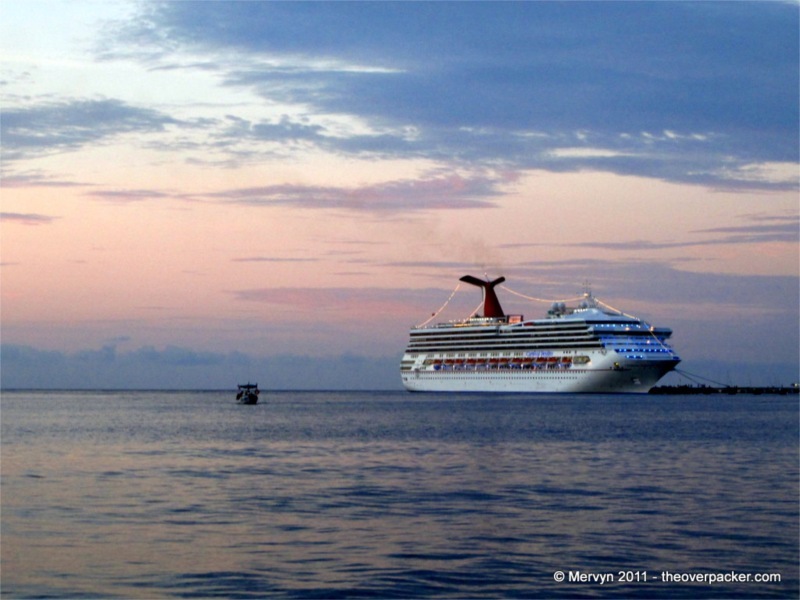 Nice pics … I ve never been to Cozumel, but it´s one of the places I have to see in 2012.